Last week saw the tenth anniversary of the war in Afghanistan..
Photo: Emilio Morenatti/AP. Afghanistan. October 4, 2004. 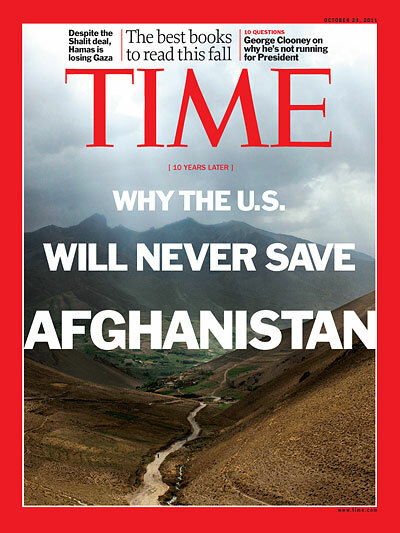 Just noticed Patrick Witty tweet that this week’s TIME International cover story is on Afghanistan..Cover photo by Adam Ferguson…My eyes were drawn to the headline that accompanies the image… “Why The US Will Never Save Afghanistan”…you compare that to the famous 2010 cover with Jodi Bieber’s Aisha portrait with the headline “What Happens if We Leave Afghanistan”,and I would argue there’s been a change in Afghanistan thinking at TIME’s editorial desk…see the covers side-by-side here. Photo: Martin Adler/Panos. Afghanistan. Kabul. 2002. BagNewsSalon webinar discussing the visual framing of “The Great Recession” in the United States and Europe : Date: Sunday October 16th : Time: 10 am PST/1 pm EST/6pm GMT (running for 90 minutes) : Where: Open-i platform, hosted by the London School of Communications, via live audio : Facebook RSVP here. photo: Bruce Davidson .. Was fiddling Davidson’s book last weekend…Stunning photos.. Applications for the Tim Hetherington Grant are due 15 Oct. This entry was posted in Contemporary Photography, photojournalism, Uncategorized and tagged Adam Ferguson, Afghanistan Kabul, Bieber, Bronstein, Chris Hondros, Contemporary Photography, Editorial Desk, Emilio Morenatti, Gillian Laub, Martin Adler, Michael Kamber, Nachtwey, Pancho, Photographer, Photographers, Photographs, Photography., Simon Norfolk, Tel Aviv Beach, Tenth Anniversary, Tim Hetherington, Time International, Tweet, War In Afghanistan, War Photographers on October 13, 2011 by Mikko Takkunen.